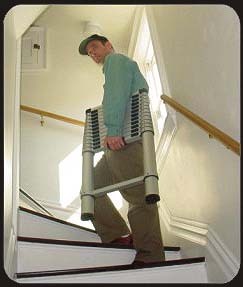 Emergency Fire Escape Ladders for Home and Office! Custom Warehouse, Industrial and Plant Ladder Solutions! Call, Fax or email for International Shipments! Be sure to click on picture or system for more information or to order! The Res-Q-Ladder® is designed for use in 2, 3, 4 & 5 story homes, apartments & offices. The window sill hooks fit walls up to 10 inches thick. Quick-Escape® ladders provide an extra measure of safety and peace of mind for most second & third story homes and apartments. First UL Listed Emergency ladder. 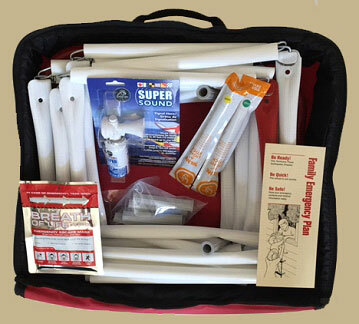 The Sure-Escape® Emergency Kit includes the essentials for a safe and proper egress from a 2, 3 or 4-story home, apartment or building. Red Rung® ladders are designed for use in 2, 3, & 4 story homes, apartments and buildings. It is bolted to the floor directly below a window. Stores in its own case. Pearl Protected® ladders are mounted in the wall beneath a window. For 2 and 3 story homes - Architecturally discreet. Fixed-Escape® warehouse and industrial ladders are available in eight models. With or without cage and security doors. 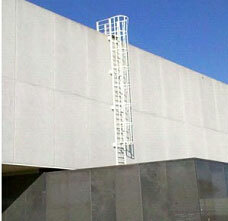 Fixed-Escape® ladders are aluminum and fold up like a drainpipe. Always available and easy to use. Architecturally discreet - folds to a 3 1/4" x 3 3/4" column. Commercial Fixed-Escape™ by JOMY are available up to 50 feet. Extra safe with a hand rail. Architecturally discreet - fold to a 5 1/4" x 5 1/4" column. Counter–Balanced ladders are extremely strong and will last a lifetime. Available with or without Cage. Custom designed for your situation. Commercial Fixed-Escape® Balconies by JOMY are available in two standard sizes: 24” x 44” and 38” x 44” Custom sizes are available. Perfect companion to permanent ladders. Fixed-Escape by Jomy Fall Restraint System complies with EN-363, EN-351 and OSHA Standards. Eliminate a cage when added to retractable or Counter balanced ladder. Made from strong extruded anodized aluminum - allows heavy load bearing yet very light and weather resistant. Ideal for Home Inspection, Contractor, Home Owner, RV owners! Made from strong Aerospace Engineered aluminum -Closed Size is 30 inches X 19 inches Open size 12.5 feet. 250 pounds per rung loas capacity. Available in 8.5,10.5,12.5 & 15.5 feet and 7.5 Step Ladder. 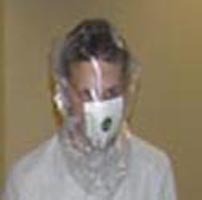 Single-use personal evacuation first-aid mask is simple and easy to store and use. Have peace of mind in the event of a fire or bacteriological emergency.